24 When a farmer plows for planting, does he plow continually? Does he keep on breaking up and working the soil? 25 When he has leveled the surface, does he not sow caraway and scatter cumin? Does he not plant wheat in its place, barley in its plot, and spelt in its field? 26 His God instructs him and teaches him the right way. The Bible uses many comparisons for God’s efforts to gather His people. We often remember the stories about a vineyard. Here we have a comparision about a farm field. When a farmer plows for planting, does he plow continually? The point being made here is that the farmer does not spend all of his time in ploughing the ground, in order to plant it, or, as these verses go, in continuing his efforts to break up the clumps of earth. The farmer works the earth several times, preparing it first for planting. Then the farmer sows his seeds, turns them under. Later there is a time for harvesting, threshing or beating the grain off the stalks and grinding the corn for his own use. So the question being proposed is who gave mankind this knowledge? These verses teach us that God has His times and seasons and that the methods of God’s providence also have their seasons. Therefore, even though the Israelites were guilty of great folly, in flattering themselves, and despising God’s threatenings commands brought to them through the prophets, God still was patience with them. God, however, would still take time to “thresh and break them” with his judgments just as God was preparing him with His plowing and working of the soil. This parable is about the way that the farmer prepares the soil to receive seed. 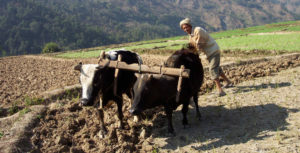 Once he has ploughed the field, he does not need to repeat the action. To plough the field may seem to be a painful way to act towards the soil. But the action achieves its purpose. It prepares the soil for the seed to grow and to produce a harvest. God acts in a similar way. After he has punished his people for their evil behaviour, he does not repeat the painful action. God is aiming to achieve his real purpose for his people’s lives. What kinds of actions that seem “destructive,” can you think of that are required to have a good outcome later? How would you retell this story in modern terms now that most people do not know about how to farm? What evidence can you think of that proves God is the source of human wisdom? If you used this analogy of plowing, further tilling, planting, harvesting, preparing grain by grinding to teach a lesson, what would should that lesson be? 20 Now there were some Greeks among those who went up to worship at the festival. 21 They came to Philip, who was from Bethsaida in Galilee, with a request. “Sir,” they said, “we would like to see Jesus.” 22 Philip went to tell Andrew; Andrew and Philip in turn told Jesus. 23 Jesus replied, “The hour has come for the Son of Man to be glorified. 24 Very truly I tell you, unless a kernel of wheat falls to the ground and dies, it remains only a single seed. But if it dies, it produces many seeds. 25 Anyone who loves their life will lose it, while anyone who hates their life in this world will keep it for eternal life. 26 Whoever serves me must follow me; and where I am, my servant also will be. My Father will honor the one who serves me. The Gospel According to John is one of the four gospels in the New Testament included in the list of sacred books officially accepted as genuine. It traditionally appears fourth, after the synoptic 4 gospels of Matthew, Mark, and Luke. John begins with the witness and affirmation of John the Baptist and concludes with the death, burial, resurrection, and post-resurrection appearances of Jesus. Although the Gospel of John is anonymous, Christian tradition historically has attributed it to John the Apostle, son of Zebedee and one of Jesus’ Twelve Apostles. The gospel is so closely related in style and content to the three surviving letters (1 John, 2 John and 3 John) that commentators treat the four books, along with the Book of Revelation, as a single grouping of literature, although not necessarily written by the same author. The discourses contained with this gospel seem to be concerned with issues of the church–synagogue debate at the time of its creation. It is notable that in John, the community appears to define itself primarily in contrast to Judaism, rather than as part of a wider Christian community. Though Christianity started as a movement within Judaism, it gradually separated from Judaism because of mutual opposition between the two religions. Verses 20-21 Some Gentiles followed the Jewish religion. They believed in Israel’s God and they worshipped him at the important Jewish festivals. Some of these Gentiles who were Greeks wanted to meet Jesus. Although Philip was a Jew, he had a Greek name. Perhaps that is why these Greeks came to him. Verses 22-23 Jesus’ reaction to Philip and Andrew’s request seems strange. He did not even mention the Greeks. But he was answering them. He began to talk about his death and to explain it to them. Jesus’ death was the only way that people could enter God’s kingdom. And God’s kingdom is for everybody who believes in Jesus. It is not just for the Jews. When Jesus died on the cross, he provided the way for all people to receive eternal life. He had spoken before about his ‘time’ (John 2:4). That time had come. Verse 24 Jesus used a familiar situation in nature to explain why he had to die. There is only one way for a seed to produce more seeds. The seed must fall into the ground. Jesus compared this to his death. If the seed does not die, it will not produce more seeds. So Jesus had to die as a sacrifice. He had to receive the punishment that we all deserve. Also he had to show that he had power over death. His resurrection proved that he had eternal life. He gives this eternal life to everybody who believes in him. These people are like the new seeds that the original seed’s ‘death’ produces. Verse 25 This verse does not mean that we should want to die. It does not mean that we should not enjoy our lives. It means that we should live to serve God. We should not live just for our own pleasure and comfort. We should not find security in the things of this world. Instead, we should want to do only what Jesus wants. We should not be selfish. We should not try to control our lives. We should let Jesus control our lives. Then we will be really free. We will be really happy. We will receive the gift of eternal life. This wonderful life begins when we first believe in Jesus. And it continues after our death. Verse 26 Jesus knew that he would suffer. People would reject him and they would hate him. They would kill him in the cruellest way. We must expect some people to reject us and to hate us. We may even have to die because of our beliefs. But when we follow Jesus sincerely, God will reward us. He will greatly respect all who are loyal to his Son. This is worth more than anything that this world could offer us. Do you personally experience hatred because of your faith? If so, how? If you had to describe what it means to turn one’s life over to Jesus, what would you say? What one word would you use to describe how we are to live in this world? Name three things a Christian could be doing in this world to please God? Why do you think that “Greeks” were attracted to Jesus? How do we help people to follow Jesus, turning their lives over to Him?